A metallographic examination performed using the naked eye, or with minimal magnification, is called a macroscopic examination. 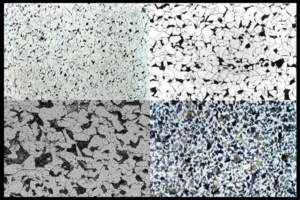 Using sample preparation techniques similar to those used in microstructure examinations, macrostructural details of a metal are revealed. Typically, a full cross-section of a part is examined. A cross-section is evaluated for the presence of various detrimental conditions, such as laps, cracks, seams, pores, surface conditions and centerline conditions. Grain flow is also commonly assessed in forged products. Macroscopic examinations assist in qualifying the overall condition of finished products. Accu-Test Labs performs macro examinations for qualifications of forgings, finished products, and welds. The law states that we can store cookies on your device if they are strictly necessary for the operation of this site. Necessary cookies help make a website usable by enabling basic functions like page navigation and access to secure areas of the website. The website cannot function properly without these cookies. For all other types of cookies we need your permission.